A wedding invitation is a request asking the recipient to attend a wedding. Your wedding invitation should reflect your personality and personal preference. Wedding invitations are created using a number of methods such as printing, letterpress, engraving, embossing, lithography, thermography and calligraphy. The colour and style of your wedding invitation, should compliment the type of wedding you are having, and will serve as a first glimpse into your wedding day. Your typeface should also coordinate with your wedding style. When selecting your wedding invitation, keep in mind your colour scheme, flowers, wedding dress, theme and other wedding elements. If you are a do-it-yourself couple, you can use any method you feel proficient in However, typically a DIY wedding invitation will be designed and printed using a home computer and printed on a laser or inkjet printer. There are several programs that you can use to design and print your invitations, including Microsoft Word, Adobe Photoshop, and Adobe Illustrator. Wedding invitations use to be hand-written and can still be done this way. If you will like to approach handwriting your invitations, I suggest giving yourself lots of time to do so. You can also enlist the help of a friend or family member whose handwriting you really like. Ideally the same person should handwrite all of the invitations. 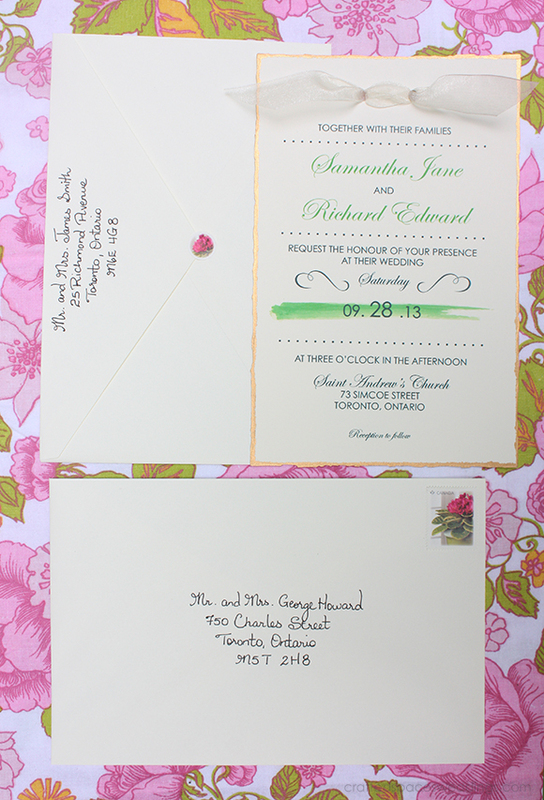 A growing trend is to order your wedding invitations online. There are many web sites available and you can view their catalogues, order and ship to your door. Many of these print-on-demand companies will also allow you to customize your invitation, which provides you with the option of adding some originality, with the advantage of a commercial print job. Eco-conscious couples can source out invitations that are printed on sustainable materials or recycled paper with vegetable based inks. If you will like to go one step further you can also opt for an e-wedding invitation and forgo entirely on paper wedding invitations. You can also create a wedding website that will inform and keep your guest up-to-date on your wedding activities. A wedding website is also a great way to share wedding photos at a later date. Traditionally it is the mother of the bride on behalf of the family that issues the invitations. The wording on your wedding invitation will depend upon the level of formality, your culture, language, and who is issuing the invitation. The wording is traditionally written in third-person. The hosts is generally the person who will address the recipient. If the bride's parents are the hosts, then the text will generally begin with "Mr. and Mrs. John W. Smith," "Doctor and Mrs." or "Doctor and Mr." The rest of the wording will vary. In North America, the line "request...presence" is used when the ceremony is held in a house of worship; "pleasure of your company" is used when it is held elsewhere." If the groom's parents are also hosting the wedding, then their names may also be added. As more couples are hosting their own weddings then their names will be used as the hosts. They may also indicate "together with their families," "together with their parents" or "and family." You can use double envelopes or just a single envelope. In the case of a double envelopes wedding invitation suite, the inner envelope is generally lined and is not gummed (no glue). The inner envelope is a little smaller and fits into the outer envelope, which will have your return address and the mailing address of the recipient. The inner envelope is generally addressed with the names of those invited, including children. If you will like to save on cost and paper you can forgo on double envelopes and go with a single envelope option. The rest of your wedding invitation suite may include a RSVP response card, a separate wedding reception invitation, map, and other wedding information for out-of-town guests. Wedding invitations should be mailed within six to eight weeks of your wedding date. If you have out-of-town guest, you will want to mail your invitations earlier to provide them with adequate time to make arrangements. An alternative is to send a Save-the-Date card in advance of your wedding invitation. Guest should be asked to send their RSVP a minimum of two weeks prior to the wedding date. This will provide you with adequate time to make final arrangements with your venue, caterer and other wedding vendors. Other matching items that can be included are, your program, menu, place cards and table cards. You can also print labels for your wedding favours or create party favours. 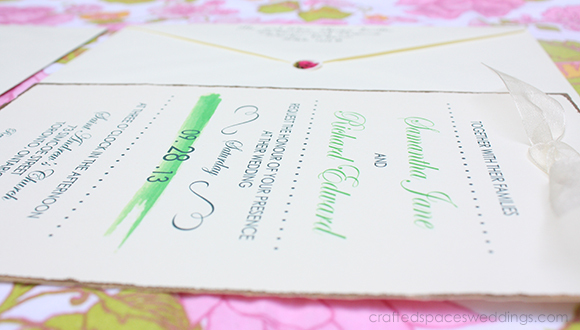 Your wedding invitations should be addressed by hand. When addressing your invitations "spell it out," do not abbreviate the "Street," "Boulevard" or "Apartment." However, "Mr. and Mrs." are abbreviated, and remember to use appropriate titles. 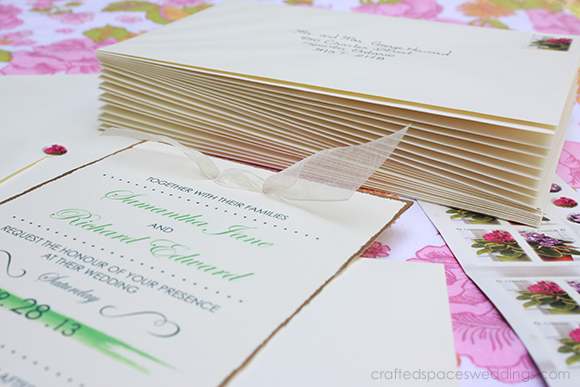 Designate a space for addressing and assembling your wedding invitations. 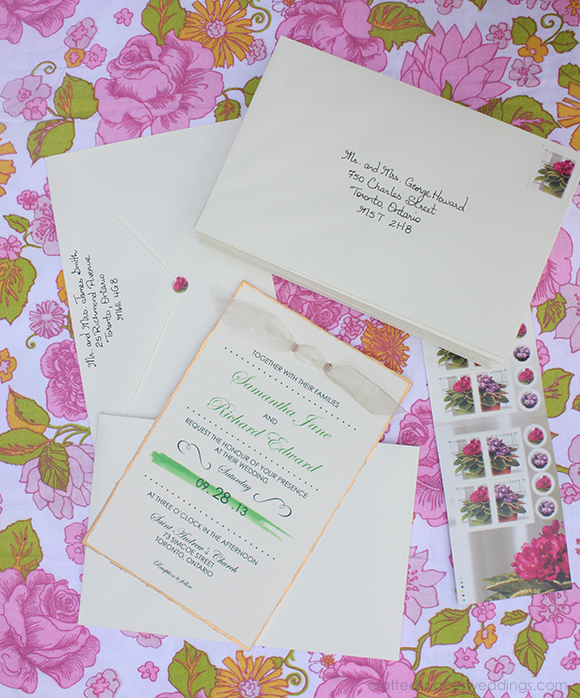 Give yourself adequate time to get your invitations assembled and ready to mail. Take one of your assembled invitation suites to the post office and confirm the amount of postage required. I also suggest having a way of tracking your RSVPs. You can use Excel, Microsoft Word or other computer tracking methods to keep on top of your guest list. You can also print out or handwrite your guest list along with their addresses, and place a check mark next to their names as you receive their reply. This list is also helpful later as you send out your "Thank You" cards or letters.